Remixes, guests at DWDD and almost show time! New Cool Collective have been happily grooving on 25 years of fame thanks to their unique mix of jazz, dance, latin, salsa, afrobeat and boogaloo. They are always funky, energetic and danceable. As pioneers in the Dutch jazz scene NCC has received many awards and the band have toured the great expanses of Benelux, Great Britain, Germany, Africa, Canada, Russia and Asia. They not only play hipster jazz clubs but also such huge pop and rock festivals as Roskilde (Denmark), Sziget (Hungary), Fuji Rock (Japan), Lowlands (Netherlands), Camden Mix Festival (UK) and the Aberdeen Alternative Festival (UK). And they collaborated with many Dutch and international artists on tour and in the studio. To name a few: Tony Allen, Mapacha Africa, Andrew Roachford, Jules Deelder, Typhoon, Guus Meeuwis, Matt Bianco, Thierno Koite, John Buijsman and Georgie Fame. 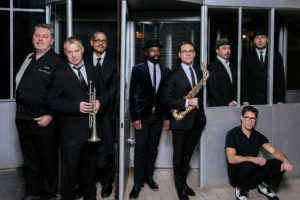 NCC includes saxophonist Benjamin Herman, guitarist Rory Ronde, drummer Joost Kroon, percussionists Frank van Dok and Jos de Haas, pianist Willem Friede, bassist Leslie Lopez and trumpet-player David Rockefeller.